The Barrow-Downs - Middle-Earth FAQs and Misconceptions. How many Wizards were there? The wizards, istari, 'the wise', being their Elven name, are characters appearing on all levels of Tolkien's fiction, from the very beginning in The Hobbit, where we meet Gandalf and hear of Radagast, over The Lord of the Rings, dealing in detail with the two great wizards Saruman and Gandalf, to late notes and letters, often of a difficult nature. Through most of the writings, their order remains somewhat mysterious, and only the late writings can shed some light on questions regarding both details and important facts, such as the two Blue Wizards, or the actual number of 'the wizards'. In fact, even though a quite definite answer can be given to the latter, the difficulty of the texts about the istari can be misleading, and it is often supposed that less is known than is actually written. How many istari, wizards, how many members of the Heren Istarion were there, if we can know for sure? The short answer for the impatient reader is "five, and no more". This could imply that the Heren Istarion was an ad hoc formation of the five Maiar that were to go to Middle-Earth as messengers. The statement "members of their [sc. the Valar's] high order" (ibid.) precedes the "of this Order the number is unkown"(ibid. ), it is therefore likely that the latter refers to the Valar. Note also that in the istari essay at hand, the term istari always only means the five that went to Middle-earth and are known to us; it has to be considered unlikely that a line such as "Indeed, of all the Istari, one only remained faithful" (ibid.) could even leave the possibility of Istari in Aman at all, since they, remaining as Maiar in Aman as they were, could not fall like those that went East. Again, we have here the order of the Ainur, and no hint of an order of the Wizards beyond the five. The leading r�le of Curun�r is, as the quote shows, only due to the 'Valinorean' stature, not stature in the Heren Istarion -- the first led to the latter, obviously, implying that the Heren Istarion was indeed an ad hoc formation. Also note that the last line given above shows that there hardly was such a thing as an 'order' even in Middle-earth; had there been a fixed unity between the five aforehand, it can assumed to have been otherwise: assuredly, they would have acted together. The council which picked the five istari, was, as Tolkien wrote, "a council of the Valar, summoned it seems by Manw� ('and maybe he called upon Eru for counsel? '), at which it was resolved to send out three emissaries to Middle-earth" (ibid.) and is also of utmost importance for the question. Not only does it show that the Valar did not consider the Heren Istarion as the body from which to recruit the messengers, it is also highly interesting that the number originally designed by the Valar to depart East was three, and the other two only joined for other, practically unnecessary reasons. The absence of the Heren Istarion from the council's considerations implies of course that the order was formed ad hoc for the mission, and the initial number of three plus later two gives its number precisely. Since there are no other members of the Heren Istarion, simply because the five we know were its founding members, there were also only five istari in it at all. 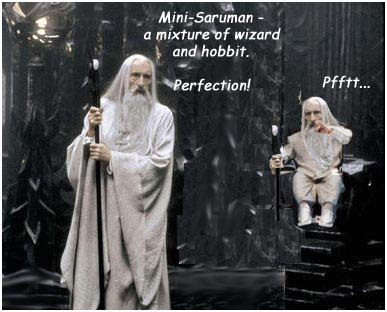 In short, the conclusions that can safely be drawn from an attentive reading of the istari essays would be that the order of the Heren Istarion consisted of the five Wizards we know, and that it only came into being with their mission, and ceased to exist with the passing of Saruman at the latest. There were obviously no istari in this narrow sense beyond the five. Linguistically, of course, istari, wizards, means nothing more than 'versed and wise in the ways of the world' (see above). Now, undeniably, this can be applied to all Ainur, and the question about the number boils down to a question about the definition of the term istari. If we are to distinguish the Five from the other Ainur for their mission they went on, we are led to the differentiation explained above. It is clear that throughout most writings, and practically all analysis thereof, this distinction is being made. If the Five are seen as istari together with all other Ainur, no less wise than they, one obviously comes to the same conclusion -- for the number of the Order of the Ainur is and will remain unknown. In that unlikely case, we could not give the number of the istari, but definitely of the members of the Heren Istarion, defined as the ones to go to Middle-earth and defy Sauron. However, the compressed composition of the istari essay, and its careful wording possess the ability to evoke only more questions. The specification that 'they' came to the "North of Middle-earth" (ibidi), may or may not mean that others of the order referred to before that statement, sc. Ainur, were sent to other parts. What makes this wholly unlikely, however, seems to be the way the three/five istari were chosen by the council of the Valar, which leaves little room for wizards which were to join the five, but were simply not mentioned. To what degree the specification of the istari as "of whom it is said there were five" (LR, App. B) can be interpretated to mean 'of whom there were allegedly five' is questionable. For one thing, it can simply mean that the number was already stated as fact, i.e. said, earlier. The other point is that the notes and essays on the istari, which are most important to determining their number exactly and beyond doubt, came later than the Appendices to The Lord of the Rings. Perhaps Tolkien was, at the time of writing the appendices, unsure himself, and later felt the need to remove the uncertainty (which he may or may not shared for some time himself) about the number of istari. A last provocative quote from the UT essay would be "of this Order the number is unknown; but of those that came to the North of Middle-earth, where there was most hope [...] the chiefs were five" (UT, IV, ii; my stress). Even though 'the chiefs' clearly refer to the istari, it is highly doubtful whether much meaning should be attributed to it.The reading that if five were the chiefs, then surely there must be more lesser ones is logical, but does not account for the fact that the statement itself may well be clear, but is not definite, not an author's explanation. If one wanted to maintain that wording at all cost and reconcile its meaning with the other texts, one might apply it instead to "the Wise" which are defined as "the chieftains of the Eldar and the Istari" (HoME XII, 1, viii) and "the Istari and the chief Eldar" (LR App. B) in the published version. Nevertheless, taking into consideration that to most, the nature of the istari was not clear, and that they were commonly mistaken for Elves (at least among men) might show how the lines could have been blurred here. Tolkien himself briefly and hesitatingly wondered whether Glorfindel was a wizard (cf. HoME XII, 2, xiii). This says both that the number was hard, if not impossible to tell for outsiders, because it was intentionally kept hidden (from Sauron), and that there very clearly were five. Statements not definite about their number, such as the two discussed above, can therefore contributed to writers within the fourth wall, or the author implying that knowledge in the created world was not certain. How many Istari came to Middle-earth?